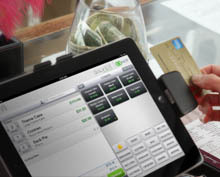 NCR Silver is a complete marketing and point-of-sale solution that runs on your iPad®, iPhone® or iPod touch®. 7 Day a Week TRUE Suppport! Our iPad POS lets you track sales and view powerful analytics, engage with customers in a meaningful way, and take your business wherever your customers are. NCR Silver is easy. Simply connect your iPad®, iPhone® or iPod touch® to the Internet and download the app. After you log in with your unique NCR Silver ID you can create your store, enter inventory and customer emails and start selling. Before you know it you’ll be tracking sales, marketing to your customers and selling everywhere you want to sell. Multi-site – If you have more than one store, you can setup a 'company view' to manage items across all your stores, see a consolidated view of store sales data, and easily navigate to individual stores for site-level sales. Time Clock - Employees can clock-in and clock-out at the POS and you can track and export employee time in the back office. User roles – You can define user roles, and then assign those roles to your employees, and you’ll have administrative control over their access to certain functions on the POS and the back office. Easier returns – Return Mode is a simpler way of doing returns, and gives you the ability to apply a return to an original sales transaction. Customer Community – Your Silver customers will have access to Silver Sidewalk, our customer community where merchants can find answers to FAQ’s.